Cape Town’s premier inner city electronic music festival CTEMF kicks off this week with an array of in-depth workshops and discussions. Day one begins at Red Bull Studio in Cape Town with a session on maintaining a career in the music industry. From there, Ready D and DJ Eazy will be explaining the process of submitting music to radio before ANG sheds some light on Syncopate, an initiative to get local music into the hands of the headlining DJs at CTEMF 2017. This will be followed by a chat with Cape Town rapper YoungstaCPT. Day two continues at the Red Bull Studio with a listening session for local producers, followed by a discussion on the history of house and techno music, including a showcase of the various hardware components that have been used to create these sounds since the late ‘80s, including the Roland TR808, 909 and TB303. Closing day two, Ninja Tune founders Coldcut will be on the couch talking about their globally influential careers within the trip hop genre. Guga’s Thebe in Langa, Cape Town will host the third and final day of the workshops on Thursday, February 9th, starting with Langa residents and creators of 021 Live, DJ Fosta and DJ OD, who will create a song live in conjunction with the audience, which will be mastered after the workshop. The second session features Pulse Africa general manager Kavir Magan, representing the Association For Electronic Music, as well as Pierre-Marie Oullion, from Lyon based music festival Nuits Sonores (brought to you by The Institut Français) and Jesler Amerins from Amsterdam Dance Event. Titled The Electronic Ecosystem, the session will cover the global electronic music industry and the role South Africa has to play, with an open discussion to take place at the end. The three-day workshop will close with Kid Fonque and Jullian Gomes, two established and influential local artists, taking to the couch to chat about their various successes and imparting knowledge to aspiring DJs and producers, as well as answering any questions the audience might have. 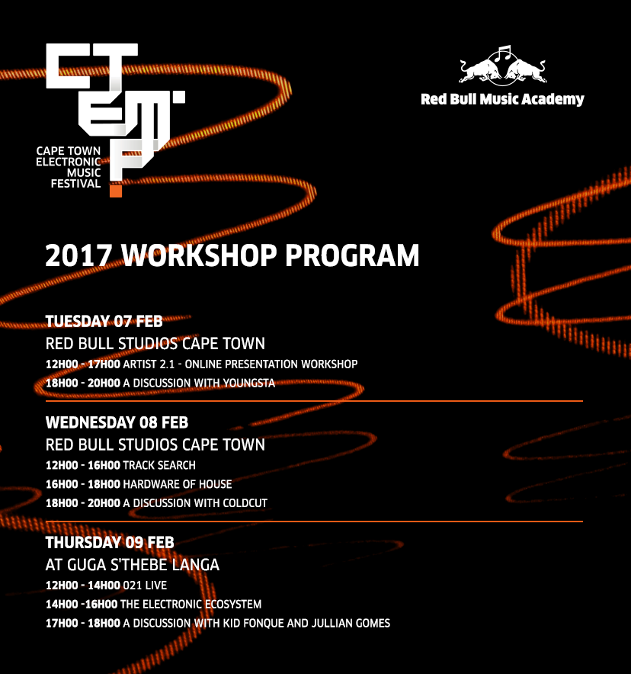 The CTEMF workshops have been a staple in the CTEMF schedule since its inception in 2012 and will undoubtedly leave more and more eager musicians with valuable knowledge to help them on their journey to success within the music industry.